In Years 7, 8 and 9, girls have an hour long Computer Science lesson each week. In each year group students are taught in two groups on a mixed ability basis. The schemes of work follow national guidelines and are structured so that each term is taught as a distinct unit to ensure that each topic is covered thoroughly. 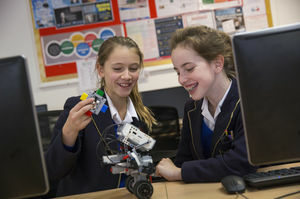 Girls learn about Office applications, Web Design and Networks, Online Safety, Images and Graphics, Photo-manipulation, Animation, Video Editing, Control Technology, Robotics and Computer Programming. 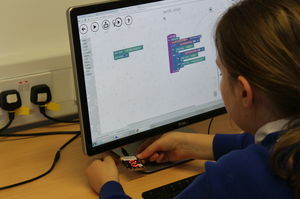 In Years 7 and 8, Computer Science focuses on the creative possibilities of the subject and girls are encouraged to have fun whilst exploring what technology can do. In Year 9 the subject becomes more academically rigorous to prepare students for taking GCSE Computing. Computer Science lessons consist of three one hour lessons per week. In Years 10 and 11 Computer Science is an optional subject and students cover the necessary syllabus for entry to GCSE examinations via the OCR examination board. New and broader theory topics are introduced. Practically, students build upon knowledge gained in Years 7, 8 and 9. Students complete three forms of examination weighted 40% each for two written papers and 20% for a Programming Project. Computer Science has been fundamental to many of the exciting scientific and technological advances of the 21st Century; from modern conveniences such as contactless payments, to DNA sequencing, or number-crunching data generated by the Large Hadron Collider. In Computer Science lessons, students will focus on developing the ability to think computationally, that is, how to break down a problem into a logical series of steps, which can then be written as a program and executed by a computer.